What has Permaculture got to do with a makerspace? Most of the activities taking place in a workshop are attempts to slow the natural decomposition of our things, or to invent something new. We oil and sharpen the tools, try to make wooden toys that do not rot or deteriorate, invest in the newest SoCs, and hope not to find any unwelcome biological activity taking place on leftover food or beverage containers when we arrive. It is easy, then, to create a binary where we makers and mechanics and programmers exist apart from the natural world – or at least have a sufficiently different tool kit from farmers and gardeners that we need not study each other. As it turns out, a compost heap is not all that different from an engine in function, and neither is all that different from a good party. Fuel and oxygen are needed in correct proportion to facilitate the chemical reactions that produce our desired result. We are stewards of an elaborate dance of chemicals and energy flows. Knowing what is tolerable (a little oil on the surface, some squash poking out the side, or a minor off-color joke) and what needs a little attention (blue or white smoke, too many flies and stinky rot, complaining neighbors), is an exercise in patience, experience, and judgement. Tuning up a bike and fine-tuning a compost heap require different skills but rely on the same principles of harmony, balance, insight, and moderation. Perhaps the same principles could be applied to building a culture of sustainable growth in a volunteer-run organization. I want to talk about how the principles I learned from studying Permaculture (before I even knew what a makerspace was!) apply to managing a community workshop. Much of this could be adapted to other types on non-profits, other types of workshops, other types of clubs, or other types of management. That term – Permaculture ™ – was coined by Bill Mollison and David Holmgren to describe a type of system. David was a big-picture visionary who wanted to develop a school of thought with the potential to change the course of human development. Bill wanted to lay in a hammock and have his favorite foods fall directly into his mouth. Together they authored a body of work describing the principles and practices that might support those two visions. If a mono-culture is a field of corn, and a poly-culture is a co-planted garden bed, then a perma-culture is a system that is regenerative, self-reinforcing, and capable of perpetuating itself while supporting the humans who tend it. 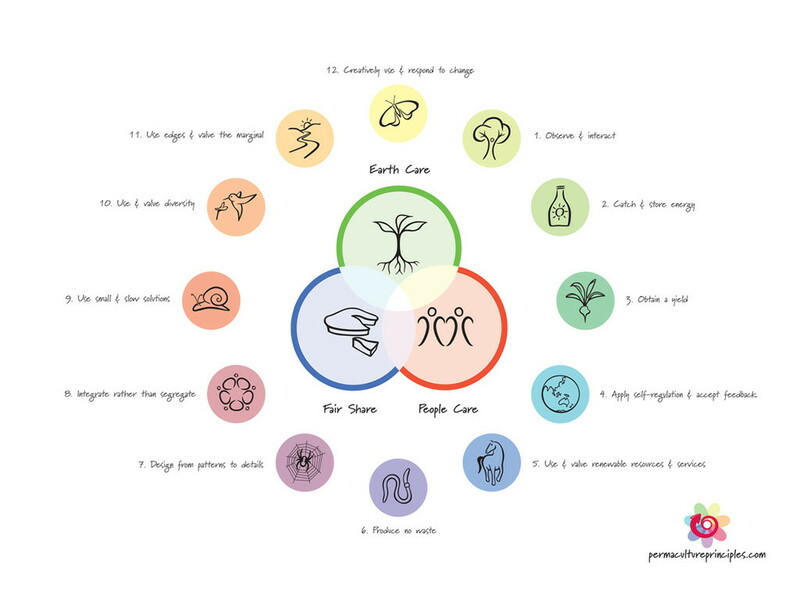 In essence, the school of thought known as Permaculture ™ can be stripped down to 12 principles which form the backbone of that design philosophy. A system which adheres to these principles could be called a permaculture system – be it a garden, a community, a business, or a makerspace. For the most part, I find that the principles cleave to the adage “Sufficiently profound wisdom is indistinguishable from common sense”. I’ll touch on each briefly. This is the foundation of all the other principles – observe rather than assume, and interact rather than sit by passively. The shed is falling down. Time to intervene. People really seem to love gathering around these little tables. How can we make more spaces like that? Junk and detritus always seems to pile up in that one corner. What is the solution here? On a homestead site with vertical change, arresting the flow of water high up means that gravity can be used to deliver it when and where it is needed. A brick wall will warm up in the sun and release that heat in the evening as the air cools and you watch the sunset. All of these excited people just stopped by unannounced! Maybe they can help paint that big wall, or move a pile of lumber closer to where it needs to be. Our intern is very motivated – let’s get her into a project that makes a durable change or improvement when she is gone. 3 – Obtain a yield. If you are not getting fed from your garden, it is not sustainable. Plant things you like to eat! Gallery night is coming up. Let’s make membership a good value and convert visitors to members. Then we can use the revenue to get tools for all the members. The yield is members and tools! We are going to be hosting a table at the upcoming conference. How can we help people have more of those “a-ha!” moments? The “A-Ha!” moments are the yield. What is the next thing we are going to ask for when a friendly banker or chamber of commerce representative turns up? 4 – Apply Self-regulation and accept feedback. When harvesting ramps in the forest – start with one quarter of the patch and see how it grows back next year. Take them all and you will soon be out of luck! If we are not being considerate of each other (and the neighbors), this whole thing is pointless. New Rule: Don’t make us make new rules! Remember that water you stored uphill back in principle 1? If the creek flows year-round it might be a good candidate for watering your flower beds! This grant is only good for one year. What funding sources could provide sustained income? Here in Ithaca, thousands of students a year come through, many looking for projects or internships. How can we make good use of that resource? 6 – Produce no waste. Feed the weeds to the goats. Put the poop on the flower beds. Use the sawdust in the compost. Burn scrap wood for heat. Minimizing externalities can drastically reduce the number of inputs needed. This is more than “never take out the garbage”! What can we use this cardboard for? Cutoffs from re-sawn timber make good bookmarks. Our first proposal didn’t work out this time. Let’s not throw it out entirely – how can we adopt the best points for another plan? 7 – Design from pattern to details. Things that need daily attention should go closest to the porch. Things that need weekly attention can go further away, maybe over past the barn. What other patterns are at work here? Worry about the trim on the chicken coup once you know how big it needs to be. Makerspace design patterns are diverse and documented. Do we want to put all these tools in a grid, or do curving, branching patterns make more sense here? What is a good way to encourage folks to feel ownership of the space? 8 – Integrate rather than segregate. Lets grow snap-peas on the pergola so you can snack while you sit! Then the solar panel can go on top, and if the chiminea is close by, we can use it in the evening as well! Invite new members down on nights that experts are already there. What can a welder and a painter and a programmer accomplish together? How can our organization collaborate with the community college? How about the History center? Local industry? A little bit can go a long way. A small solar panel and some LED lighting, for example. Or a few trees can be carefully selected for their benefits at each stage of growth. A nitrogen fixing groudcover can build soil over years while you do other things. Combined with “apply self regulation and accept feedback” this makes a very powerful engine for long-term growth. Adding a few members each month that stick around adds up. A small group can get together and make one small change each month without making big waves or burning out. 10 – Use and Value diversity. Diverse ecosystems are robust and resistant to nuisance animals. An area of butterfly habitat will improve pollination of food crops. Having different perspective represented on the board of directors helps build a robust organization. A diverse membership creates more opportunities for collaboration and idea generation. 11 – Use edges and value the marginal. Edges, where two things come together, are places of elevated diversity and usefulness. The edge of the pond is home to frogs and dragonflies, which eat mosquitos. The edge of the woods provides shelter for deer, turkeys, and other wildlife. The edge of the porch is where you put flowerbeds! The space between studs can become shelves; the edges of a room are where clutter will pile up and should be carefully managed. The edges between two areas of different use will be where ideas are shared. The edge of what we know is where learning begins. The margin of a page is white-space, but it serves a valuable purpose! Without an empty margin, that letter would be very difficult to read. So too in a work-space. 12 – Creatively use and respond to change. Change is inevitable. Sometimes change is fun. Other times, it is not fun at all. How we adapt to change will determine if it is good or bad. Seasons change and the sun sets in a different location. How does this change where we sit in the afternoon? What different opportunities are available as students arrive, or depart? What opportunities have arisen with the arrival of the new neighbors? With membership on the rise, we are having some growing pains with keeping the storage area organized. What can we do to turn that into an opportunity? No set of principles will perfectly resolve all of the diverse challenges that come along with the endeavor of living on this planet as a human, much less running a makerspace. But having a set of principles to refer to can help provide guide-posts as we try new things and learn to work together. When examining a complex system and looking for robust solutions, I frequently turn to these principles. I believe that a system which is aligned with these guides is very likely to be a robust one that tends to grow in a way that is helpful to the community and to it’s members. Perhaps these principles are useful to you too. There is much more information about the Permaculture philosophy available online. Two foundational texts are David Holmgren’s book “Permaculture: Prunciples and pathways beyond sustainability”, and Bill Mollison’s more visually oriented “Permaculture: a designer’s manual”.